Description: The most popular ornamental grass, Calamagrostis x acutiflora has a distinct upright habit that looks fantastic all winter long. Calamagrostis x acutiflora ‘Karl Foerster’ it is a hybrid which is valued for its early bloom, vertical lines and ability to grow in wet soils. It is a slowly-spreading, clump-forming, cool season ornamental grass which features an erect, slightly arching, slender clump of narrow, stiff, rich green leaves growing to 1m (3 feet) tall and 45-60cm (18-24 inch) wide. Leaves produce little fall color, eventually turning tan in winter. In spring, tightly-vertical flower stalks rise well above the foliage up to 1.8m (6 feet) tall bearing narrow plumes of feathery, purplish-green flowers which turn golden as the seeds mature in summer and eventually tan. It is one of the first ornamental grasses to bloom in spring. Gardening: Calamagrostis x acutiflora Karl Foerster is fast growing hardy perennial and like many grasses, this tough plant tolerates a wide range of conditions. It is sterile, so mass planting can be done without fear of becoming invasive. Cut clumps to the ground in late winter just before the new shoots appear. By cutting it in fall, the nice winter appearance of this stunning ornamental grass is wasted. Cut it back to about 6cm (6 inch) from the ground. Plant or divide them early to late spring and early fall. If applicable, plant it at the same depth as it is in the pot. Recommended spacing between plants is about 45-100cm (18-40 inch). Calamagrostis x acutiflora Karl Foerster are clump forming, rather than spreading by rhizomes. They will eventually need to be divided in fall or early spring, generally every 3 to 5 years, to prevent them from dying out in the center. Position: Calamagrostis x acutiflora Karl Foerster thrive in sun to light shade positions. Blooms in light shade and appreciates some light afternoon shade in hot summer climates. If grown in too much shade, Calamagrostis x acutiflora Karl Foerster will be smaller and flop a bit. Soil: Grows in moderately fertile, moisture retentive soil. It grows quite well in moderately heavy soils, but they must be moisture-retentive and not dry out. Water: Calamagrostis x acutiflora Karl Foerster can grow in fresh-water bogs, it also does well in drier areas. Water to root depth once every 2 weeks for best results. 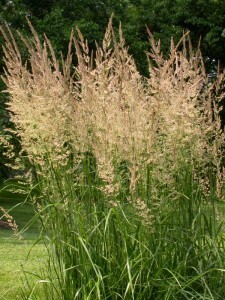 Once established,Calamagrostis x acutiflora Karl Foerster is drought tolerant. It will be a smaller plant if grown in a dry site. Fertilising: Fertilizer may be required to produce maximum height. Use a slow release, medium-rate fertiliser. Propagation: This grass will not self-seed in the garden because seeds are sterile. Calamagrostis x acutiflora Karl Foerster can be propagated by division of clumps in mid-spring every few years. Container plants: Calamagrostis x acutiflora Karl Foerster has wonderful, tall flower plumes that create an eye catching focal point when grown in a container. Although Calamagrostis x acutiflora Karl Foerster needs a bit of protection from the hot sun, it can survive winters in containers down to hardiness zone 6. It is suited to grow in 18-20cm (7-8 inch) pot, 22cm (8.5 inch) pot or 25cm (10 inch) pot – any size will work well. Soil: Use a soil based potting mixture for Calamagrostis x acutiflora Karl Foerster. 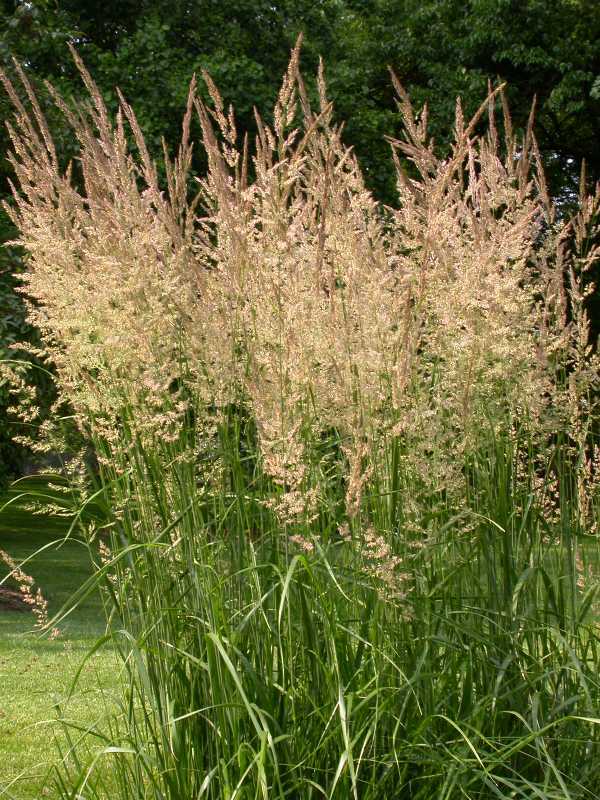 Light: Calamagrostis x acutiflora Karl Foerster will thrive in full sun or better in partial shade for the hot and dry climates. Water: Calamagrostis x acutiflora Karl Foerster require to be evenly moist. Fertiliser: Apply standard liquid fertiliser once every two weeks, from early-spring through summer. Uses: Calamagrostis x acutiflora Karl Foerster looks good either as mass, group or specimen plant. Excellent vertical accent for borders and for narrow spaces in the landscape. Also effective in moist low spots or on pond or stream banks. It is suitable for architectural, cottage or informal garden, flower borders and beds or prairie planting. Plant it ‘en masse’ to form a feathery screen. It also looks good planted next to buildings. Calamagrostis x acutiflora Karl Foerster is used as a backdrop for roses and other perennials, in arrangements.